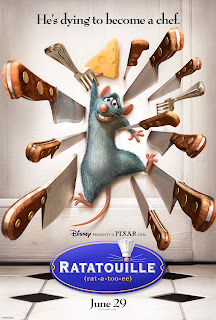 I am not usually one for cartoon movies let alone a children's cartoon movie about a rat. But I have to say Disney's Ratatouille was amazing. It was all abut food, cooking and learning how to appreciate friends, family, food and love. Remy is a rat and a lover of food - he doesn't fit in with his fellow rat colony as he appreciates food waaaay to much to eat the garbage on the streets. The scenes in this film are too cute and a good chuckle. If you have kids, watch it together, if you don't watch it anyways. It is a great flick! 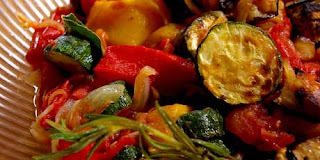 Ratatouille is an actual french dish - a slow cooked stew of vegetables and absolutley delicious. Laura Calder is a host on the Food Network for her show French Food at Home. Here is her recipe for Ratatouille. - Heat the oven to broil. Thickly slice the eggplant, and lay the rounds on cake racks which you’ve laid in the sink. Salt, very generously, and leave 30 minutes for the excess water to drain off. When they are ready, you’ll need to rinse them well under the tap and pat them dry with a towel. - While the eggplant drains, put the red and yellow peppers in the oven and broil to blacken the skin on all sides, 20 minutes total. Remove to a bowl, cover with plastic wrap, and let sit five minutes. The skin will now peel off easily. Peel and seed, then slice the flesh to julienne and put it in a large bowl. Turn the oven down to 450°F/230°C. - Put some oil on a baking sheet and toss the zucchini slices in it. “Grill” in the oven, turning once, about 10 minutes. Remove, and add to the peppers. Finally, cut the rinsed and dried eggplant into large chunks, toss in oil, spread on the baking sheet, and “grill” also, about 15 minutes. As things are done, add them to the bowl. - While the vegetables are in the oven, heat a spoonful of olive oil in a sauté pan and fry the onion until soft. Add the garlic, pepperoncino, bay leaf, and rosemary one minute. Add the tomatoes. Cook until the tomatoes are very soft and the whole mixture thickly soupy, about 15 minutes. Pour the tomato over the vegetables, toss everything. Check the seasonings. Serve at room temperature with the basil scattered over.